Barbecue – it is very responsible. A particularly important preparatory process, namely the purchase of meat and, of course, the choice of marinade. Very good fit as usual mineral water with gas, which gives extra tenderness and juiciness and soft pork, and lean beef. - 2 tsp of salt. In the evening, wash your pork, let it dry a little and cut into fairly large pieces approximately rectangular shape. Place them in a deep bowl or pan large enough that the contents were easy to mix while marinating. The optimal size pieces barbecue – 1.5-2 times bigger than a matchbox. So the meat roasts faster on the inside and burning outside. Peel the onion, cut it into rings or half rings and add to the bowl of barbecue. All sprinkle with ground black pepper, grains of coriander, selected spices and salt and thoroughly combine with your hands so the spices spread evenly. Remember a little meat to give the juice, and place in a container. Pour the prepared pork 1 tbsp. of mineral water and leave in the marinade in the fridge until morning, covered with cling film. 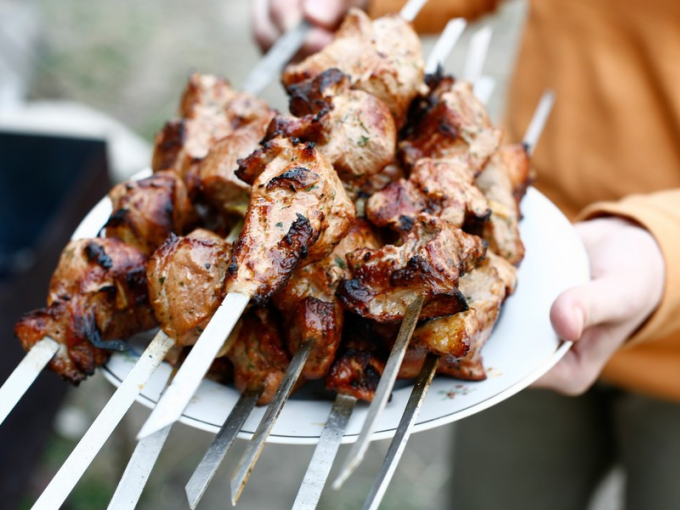 The next day, out of the house on the outdoors, string the meat on skewers and cook on the grill, basting from time to time remaining mineral water. When choosing beef for kebab please note on the clipping. There is practically no lived and muscle fibers, is the most soft and at the same time lean part of the carcass. Prepare the beef, cut it from white film and cut the pulp into the correct pieces. Remove the husks from the bulbs, slice them and combine with meat. Season both grated garlic, crumbled Bay leaf and rosemary, ground black pepper and olive oil. Prevent all 5-10 minutes. While not salt. Pour mineral water into the container with the meat, adding a little by little, each time stirring with your hands until almost completely absorbed water. Place the oppression and leave in a cool place or the fridge for 2-3 hours. Salt the meat, stir again, put on skewers and place skewers. Remember that beef should be constantly watched, so it does not dry out when roasting on the coals. With the onset of warm spring days, more and more people dream about a picnic with a fragrant odor of roasted meat and fresh juicy vegetables. Soft tender skewers to do just enough. The main thing in this process is properly prepared marinade. It is very important to carefully approach the choice of meat. Give preference to fresh homemade pork. For barbecue perfect neck piece or ham. No less tasty kebabs will succeed and pork ribs. Please note that if you decide to cook barbecue rib, this recipe will require more than pulp, about 2 kg. Cut meat into small even pieces. The ribs divide into portions 1-2 ribs. Lemons thoroughly wash and squeeze the juice. To facilitate the process of squeezing the juice, put citrus in boiling water for 2-3 minutes or heat in a microwave oven. In a deep dish mix well the meat with lemon juice. Peeled onion cut into small cubes or thin half-rings. Add to the bowl with the meat. Mix well, add salt, pepper and spices. It is easiest to use the ready mix of spices for barbecue. You can prepare this mixture. To do this, mix black pepper, red and white peppers, add paprika, and Khmeli-suneli, sprinkle a little coriander and Terry. Mix everything thoroughly in the bowl with the meat and leave for 15-20 minutes in the room. Pour the prepared barbecue silnogazirovannoy mineral water and marinate at least 2 hours. The best option is to leave the meat soaked overnight. There are some rules that should be followed in order to cook a wonderful tender barbecue. First, the meat must be completely covered by the marinade. Very good effect will give a press, laid on the topmost layer of meat. He will not allow the meat to lose juice, the shish kebab will turn softer and juicier. The marinade from the mineral water affects the structure of meat only due to the gas bubbles penetrating into it. This marinade adds barbecue no foreign specific taste, like wine or vinegar. 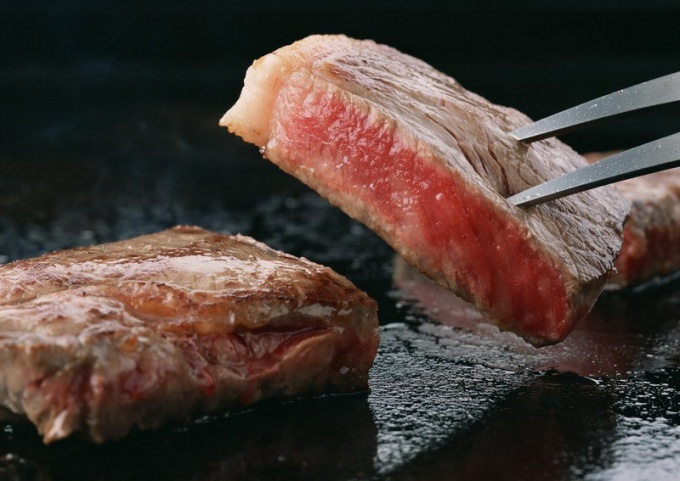 So choose a soaking way, if you want to accentuate the natural taste of grilled meat. Try different ways of marinating meats, and you will find the perfect recipe of kebabs.